When people ask me if I like sports, the conversation is doomed from the start. Perhaps ironically as I’m now cycling around the world, sport has never been something I can claim to be very good at. The only sport I can bring up when asked that question is kayaking, which isn’t much good when all the guy wanted to do was talk about football. Kayaking is something I started in university and joining the club was, for the most part, an excellent idea. Members of the club are now some of my closest friends, they know how to party and they like to do it often. The kayaking parties and festivals held across the UK are the stuff of legend and I was never happier at uni than when I was with my fellow Kayakers. The only real problem I had with the Kayakers of Aberystwyth University was their tendency to want to go kayaking. Kayaking is, by and large, a terrifying thing to put yourself through. Strapped into a leaky boat with just a hard hat and a prayer as you tumble down waterfalls or navigate fast flowing rapids, hoping that the next boulder won’t flip you over and give you a chance to survey the riverbed with your face. Sounds horrible doesn’t it? But despite these considerable drawbacks, there is something about kayaking that makes it difficult to stop. For some strange reason, the second it’s all over and you realise your head is still attached, your system is flooded with relief and happiness so potent that it almost completely erases the decision you had just made never to get on a river again. I knew that when I reached Meghalaya, a state in the North East of India, and met my uni housemates and ‘big deal’ Kayaker’s Joe and Griff, kayaking would be on the cards. 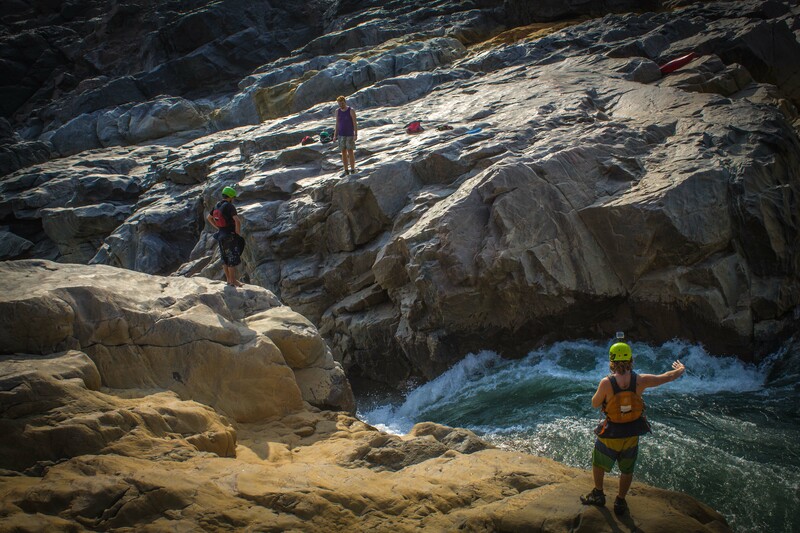 They, along with a few others, have been exploring India and the Northeast looking for new and exciting whitewater. To prepare myself, I decided not to even think about kayaking until there was no going back and it wasn’t until after an eight hour jeep ride and my first night sleeping under the stars by the river bank, when I was once again donning my hard hat and strapping myself into a boat, that I finally let the full weight of my situation come crashing down on me. Here I was, in India, not having been in a kayak more than once or twice in the last two years, on a river with drops and rapids rated 4 and 5 for difficulty, 5 being the most difficult. Not only that, but I knew that once I started there was no going back as the river takes three or four days to paddle and is surrounded by not one, not two, but three huge walls of rock, each higher than the last and all covered in dense rain-forest, making escape almost impossible. As I pushed myself into the water, gripping my paddles and gritting my teeth, I knew I was committed and despite my fears, a genuine smile somehow worked it’s way onto my face as I maneuvered into the main flow of the river and was whisked away from the beach. My first multi-day kayaking expedition had begun, and, faint amongst the calls of birds and the buzz of insects, I could hear the distant roar of water. The Kynshi was calling. The Kynshi pushes south towards Bangladesh from the West Khasi Hills through some incredible scenery. Boulder strewn riverbanks give way to dense rainforest teaming with the buzz and chatter of a billion unseen creatures. Beyond these, the sheer walls of the gorges rise in steps reaching hundreds of meters and high in the perfectly clear sky, birds of huge sizes soar. Some Kayakers have found elephant dung along the riverbank but the elusive animals themselves remain, well, elusive. The boulders that line the banks and fill the river vary from the size of cars to the size of mansions and they form the features that make the Kynshi a paradise for Kayakers. Waterfalls over 30 feet high, world class rapids featuring waves, smaller drops and recirculating holes ready to catch any kayaker too slow to react, and, luckily for me, some nerve jangling, adrenaline pumping drops and shorter rapids with calm pools below them, perfect for my level of skill and experience. I was going to be pushed harder than I’ve ever been pushed before, but my friends were there to make sure I wasn’t pushed too far. As well as Joe and Griff, Jay would be joining us on the trip. I hadn’t met Jay before but all three of them along with a few other from the UK had been spending the past few months in India as part of the All India Kayaking Expedition, blasting down rivers across India that most people wouldn’t even want to stand next to. I trusted them completely and so as I reached the first rapid of the trip I lined up behind them, waited for my moment, and charged. The crashing of water can be a very intimidating sound and I had to block it out as I made my way down. Singing the chorus of ‘Everything Is Awesome’ from The Lego Movie made this a little easier as I dodged between boulders and pushed through waves. I could see the line the guys ahead of me took and did my best to follow, but every now and then I’d slip down a different channel and then it was down to me to find my own line down the rapid. This happened once as Joe went right of a large rock and I was pulled left. The air turned as blue as the water around me as I paddled furiously to get back on track, making it successfully to the bottom after a surprise drip at the end of the rapid. I whooped as I made it to the bottom, but the day was far from over. Day one on the river was full of mini rapids, less mini rapid and monstrous torrents of water that I was happy to walk around while the others made it look easy. On one of the rapids I managed to lose my balance after a drop and in an instant I was sucked into a swirling world of water. The roaring of the water stopped and I was alone with my thoughts, which were calm but focused. I might shout and swear above water, but my considerable experience being upside down whilst my hard hat bumps and scrapes along rocks has helped me develop an almost Zen-like state in times when additional oxygen has to be earned. I got myself into the familiar position that would allow me to use the paddle to flip myself back over and one big push later the noise returned to the world. I took a deep breath, swore, whooped and continued to the bottom of the rapid. The highlight of that first day was a seven meter waterfall that for some very good reasons has been named ‘Griff’s Gash’. Here the wider river narrow and appears like liquid glass as it glides over the lip of the drop, cascading down to the pool below. I jumped out of my boat to have a look and tried to keep my cool as Jay explained the best line to take down the drop, and the move that would stop me from falling like a pencil into the water churning angrily at its base, the Boof. I got into my boat, telling myself that everything is awesome. I picked up speed a few meters before the horizon line, planning my strokes. Then the nose of my boat was over the lip, I began to tip forward and put in a huge stroke to bring up my nose as I plunged downwards. It didn’t really work so I put in another, while falling, that brought the nose level as I made a perfect landing. Well, not exactly perfect. Flushed with success I didn’t realise until it was too late that I was tilting to the right and before I even though to do the simple move the would right the boat I was breathing water, and this time my roll wasn’t working. After two attempts my Zen failed me and I grabbed for the loop that would detach my spray deck and flood my boat with water, allowing me to push myself out. I popped to the surface and the water forced me against the rock wall, I felt my paddles being pulled downwards but I gripped onto the rock and managed to keep hold of them as I clambered out of the water, yelling in exhilarated ecstasy as adrenaline coursed through my bloodstream. Even with the swim, going into Griff’s Gash is the most glorious thing I’ve ever done in a boat. The following two days were as good as the first. Day Two featured more portages as the rapids got a bit scarier and so I walked around them, usually with Joe (hero), carrying my boat. While cycling has given me ‘chicken legs of steel’, it hasn’t done much to improve the upper body. It also included what is possibly the most stunning campsite in the world, The Lagoon, were we got a good fire going and enjoyed the pools and boulders until night fell. The final day was a gentle paddle out of the gorge and to the take-out. These days each deserve their own posts, and hopefully at some point I’ll have the pleasure of reliving them as I write. But for now I’ll just say that it was an amazing experience, and all gratitude goes to Joe, Griff and Jay for getting me there, and, more importantly, getting me out. If you would like to support me on this trip then please help me by helping Hope for Children. A charity that works to help orphaned, poor, and exploited children around the world. If you’re in the UK you can text ‘JJVW50 £3/£5/£10′ to 70070. FOr worldwide donations go to http://www.justgiving.com/jamesvsworld and donate online. Thank you! I just passed you up. You’re right outside New Orleans. Were you coming down Highway 90?